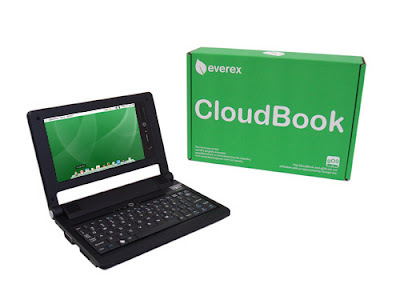 The Everex Cloudbook has a uniquely located built-in pointing device (a stamp-sized touchpad) on the upper right side instead of at the bottom of the keyboard as is common for notebooks. The design is intended so it can be held in one hand while typing, or with two hands when using the mouse-cursor control, with the left thumb controlling the two "mouse buttons", and the right thumb the small trackpad. The Cloudbook is also being sold as a rebadge by several companies worldwide.